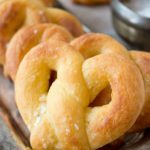 Tasty low carb soft pretzels are made with a healthy dough. They are flavorful, chewy, and make a great low carb snack. In a microwave safe dish, place the mozzarella cheese and cream cheese and microwave in 30 sec increments, stirring in between, until fully melted and almost liquid. In your stand mixer (using the dough hook attachment), place the almond meal and Xanthum gum and mix well. Add the hot melted cheese to the stand mixer and allow it to knead the dough until all the ingredients are fully combined. Around 5-10 minutes. Roll each ball into a long skinny log and twist into a pretzel shape. Place on a lined cookie sheet and give a little space with side as the pretzels will rise. When the pretzels are golden brown, remove them from the oven. Don’t burn your fingers trying to eat them immediately.